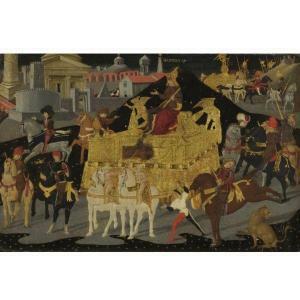 Find artworks, auction results, sale prices and pictures of Apollonio Di Giovanni at auctions worldwide. From whom most probably acquired directly by the father of the present owner. 16 3/4 by 63 1/3 in. ; 42.5 by 161 cm. 15 3/4 by 24 in. ; 40 by 61 cm. Gambier-Perry Collection, Highnam Court, Gloucestershire;Gustave Rau, Stuttgart;By whom anonymously sold, Sotheby's, London, 20 April 1988, lot 1(as attributed to Apollonio di Giovanni), to Hazlitt;From whom purchased by the present collector. 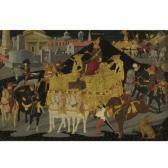 M. Boskovits, ed., The Alana Collection: Italian Paintings fromthe 13th to 15th Century, Florence 2009, pp. 32-35, under no. 6,reproduced fig. 6a. 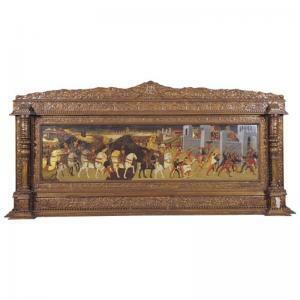 The present work can be linked to another panel, of nearlyidentical dimensions and similarly inscribed, depicting The Triumphof Caesar, formerly in the collection of Lord Farrington. Thatpanel was sold, New York, Christie's, 25 January 2002, lot 21 andis now in the Alana Collection (see Literature and fig. 1). As ispointed out in the entry on the Triumph of Caesar in the AlanaCollection catalogue, the linking of the Triumph of Caesar and theTriumph of Scipio Africanus relates to a humanist debate that waswell-known at the time these panels were made and that sought toestablish the superiority of Scipio, the republican, over Caesar,the tyrant (see Literature). 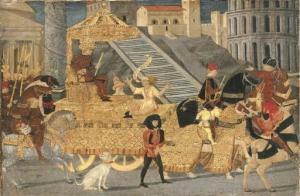 In both panels, Apollonio di Giovannihas painted the processions before settings of famous ancient Romanmonuments including the Pantheon, Colosseum and Trajan's column,all well known to Apollonio's clientele, but not contemporaneouswith the stories depicted.Although the iconography of both panels would be typical for acassone or marriage chest, and relate to Apollonio'swell-established promotion of antique themes, they are much smallerthan was typical and have therefore been considered to be fragmentsin the past (see Literature). This hypothesis has been called intoquestion, however, because both depict complete vignettes, and inthe present panel, three of the four edges seem to be intact andoriginal. It has been suggested instead that these two scenesformed the end panels of a cassone; however, their size and theimportance of their iconography would seem to eliminate this as apossibility as well. Two alternate theories seem to be moreplausible: it could be that these two panels formed the fronts of apair of cassoni, or that they functioned as parts of a spalliera, adecorative frieze inset into a bed or other piece of furniture, orplaced into the wainscotting of a room.The Triumph of Scipio has particularly important provenance, havingbelonged to the Gambier–Perry collection in London. The Gambier–Perry were notable collectors of Medieval and Renaissance Art,including works by Fra Angelico, Lorenzo Monaco and Bernardo Daddi,amongst others. Much of this distinguishd group now forms the basisof the Renaissance collection at the Courtauld Institute in London.It was suggested by Everett Fahy that The Triumph of Caesar pendantpanel once belonged to the Pucci family, who were an extremelyimportant and influential family in Renaissance Florence. The basisof this assumption is the appearance of their emblem, theblack-a-moor, two of which appear seated on horseback, drivingCaesar's chariot. 731; With Julius Böhler, Munich, by 1915; William Gwinn Mather, thence by decent. italienischen Frührenaissance, Leipzig 1915, pp. 249-250, cat. Oberlin, Ohio, which belonged to the Ruccelai and the Vettori. is sleeping. His mother Helen appears to him in a dream]." Lord Farrington; Sotheby's, London, 13 June 1934, lot 140. Warburg and Courtauld Institutes, 18 (1955), p. 12, fig. b and p.
E. Callman, Apollonio di Giovanni, Oxford, 1974, p. 73, no. 52, pl. into which they were once inserted. Pantheon, the church of Santa Maria in Ara Coeli and the Colosseum. included the blackamoor, seen here in the procession.